Custom Champion Perpetual Award Belt with 4 rounds. This belt is perfect to recognize monthly or annuals winners. 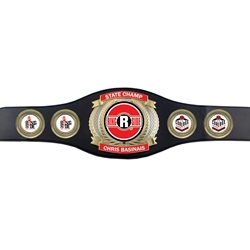 This perpetual champion award belts allows you to recognize a winner for your reoccurring event. It has 4 customizable rounds on the sides along with the dual plated 8-3/4" x 7" main center plate all built to celebrate your event. Made of vegan leather measuring 52" long and featuring 8 rows of heavy-duty snaps. Each belt comes packaged in a satin-lined presentation box.